You asked if Halloween is celebrated here. It is. It's become bigger year after year. When I first came to Japan, the only people who celebrated it were foreigners who liked to dress up in costumes and drink booze on the train. Dunno if they still do that, though... Maybe! Japan is still figuring out Halloween, it seems. Still putting its own spin on it. 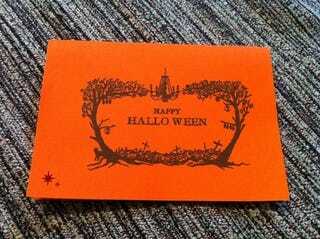 This is a Halloween invitation...to go trick-or-treating. Yep, printed up and everything! And all the candy has be separated in to cute little bags at each house for the kids. There are about forty spots on the trick-or-treat route, and every place we are spotting at is the abode of a family who is participating in the event. It's all very orderly! There is going to be a bad typhoon this weekend, so that might throw a wrench into the festivities, but there is back up plan in the works. No clue if this is how other people in Japan do Halloween. It's interesting to see, however, how Halloween is being translated into a different culture.